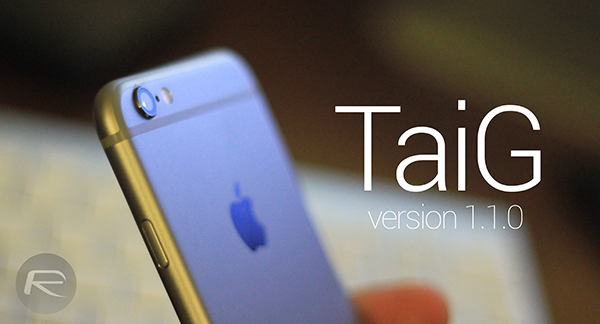 The Chinese-based team TaiG has just updated the Mac OS X version of their popular iOS 8.4 jailbreak tool for OS X. Now up to version 1.1.0, the new update is mainly a bug fix release which aims to fix an issue when using the tool for jailbreaking on a Mac running OS X 10.9 Mavericks. As always, if you are already jailbroken, you don’t need to do anything at this point. This updated release is mainly for those who have had issues using TaiG jailbreak tool on their OS X Mavericks powered Macs. TaiG jailbreak tool for Mac was originally released over the past weekend and brought the much needed support for OS X users. TaiG jailbreak supports all iPhone, iPad and iPod touch models capable of running either iOS 8.4, iOS 8.3, iOS 8.2 or iOS 8.1.3. You can download latest V1.1.0 of TaiG jailbreak tool for Mac OS X from here. If you haven’t jailbroken yet, you can find our detailed step by step instructions on how to jailbreak iOS 8.4 on Mac OS X here: Jailbreak iOS 8.4 With TaiG For Mac OS X [How-To Tutorial]. If you’re a Windows user, you can follow the instruction for jailbreaking here: Jailbreak iOS 8.4 Using TaiG v2.4 On iPhone, iPad [How-To Tutorial]. So, did this new V1.1.0 update of TaiG fix the jailbreaking issue for you once and for all? Share your experience with us in the comments section below. Had no problems whatsoever with the previous version! Remember to also put your iPhone, iPad, or iTouch in Airplane Mode after disabling everything else you need to before running the Jailbreak app. why taig won’t open on my mac version 10.7.5?need help! used pp samething i cannot jailbreak stuck on 2/8…. 110 solved the blank/chinese window error from 100 for me. No issues 1 day in. I did have the APPLE error when I I upgraded to 8.4 first, where location services cause any app using it to crash. Fixed with itunes restore to stock 8.4, no restore of iphone backup that time. I had repeated failures until I rebooted both my rMB running 10.11, and my iPad. i did both of those things up front when jailbreaking my iPhone and it worked the first time. will it support mac os 10.10.5?